Worldwide, 85% of animals used for fur are farmed in intensive, factory conditions with the remaining 15% trapped in the wild, caught in indiscriminate snares or traps. Many species are killed for their fur including mink, foxes, rabbits, sables, chinchillas, beavers, lynx, seals, raccoons, coyotes, muskrats, wolves, otters, cats and dogs. 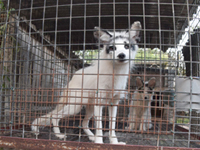 Some of the most common animals farmed for their fur are mink, fox, chinchilla and raccoon dog . Globally over 110 million animals are killed on fur farms each year while over 16 million animals are trapped in the wild for their fur . Killed for their fur each year: more than 15 million foxes ; 75 million mink; over 14 million raccoon dogs in Europe and China ; almost 200,000 chinchilla in Europe . Europe is one of the major producers of fur, contributing to nearly half of the global total, with over 5,000 fur farms, killing nearly 46 million animals a year . Denmark and Poland are Europe’s highest producers, with a combined kill of over 25 million animals per year and the number is increasing . Poland produces over 8.6 million pelts per year with annual exports of fur products worth around €3 million . Over 95% of fur skins produced in Poland are exported . The US is one of the largest importers of Polish furs, directly importing around 5% of their furs . The US has around 275 mink farms producing 4.4 million pelts a year . The US and Canada produce over 4.3 million pelts from wild-trapped animals . China kills around 87 million mink, foxes and raccoon dogs for the fur trade . In 2011 the global fur industry was estimated to be worth $15 billion (£11 billion). Europe-wide exports value over €994 million, with Italy, Greece, France, Germany and the UK reporting the highest export value . Despite a ban on fur farms, the UK is one of the largest exporters of fur in Europe, exporting over €25 million worth of garments per year. The UK imported over £4.5 million worth of fur skins, and clothing items from China in 2016. Poland is one of Europe’s largest producers of fur; more than 11% of Europe’s fur production value.